Eco-Cem panels are easy to install and line up smoothly onto the adhesive. It is necessary to pound the material with a rubber hammer and press against the corners. After laying it is recommended to cover the area with plastic sheets and place weights – about 22 pounds (or more) of weight – for 24 hours to be placed on each corner. When applying the adhesive it is important to be certain that all corners are sufficiently coated underneath. Recommended adhesive for installation of Eco-Cem is Kerakoll Superflex. The installation of Eco-Cem panels requires freshly applied adhesive. Spread Kerakoll‘s SUPERFLEX, a two-component, high-elasticity, polyurethane adhesive over the substrate with a 3/8“ (10 mm) toothed trowel. Press down with care to obtain best results. 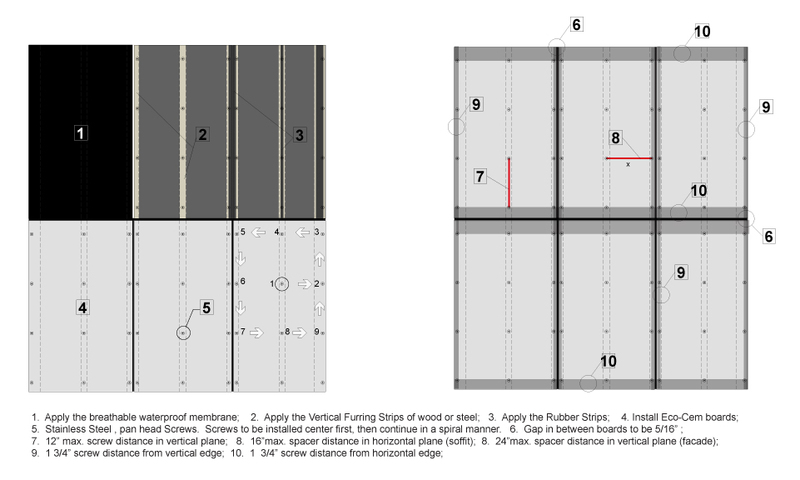 For large formats, it is advisable to install with the “buttering and floating” method of spreading the adhesive over the substrate with a suitable toothed trowel, then smoothing the back of the slab. It is necessary to keep exposed all pre-existing expansion joints of the surface. In addition, it is necessary to leave 1/8“ - 1/4“ inch of free space around the entire perimeter of the area to allow for overall surface expansion. This allowance will be covered by the skirting board and will not be visible. Please consult with your structural engineer for more detailed information. Once a panel has adhered to the surface it is difficult to remove. If a panel gets soiled by fresh adhesive it can be cleaned wih alcohol or toluene. If the adhesive has hardened it can be removed by scraping the surface with a chisel or steel wool. The quantity of adhesive needed may vary according to the surface area (approximately 0.4 to 0.5 pounds per square foot). 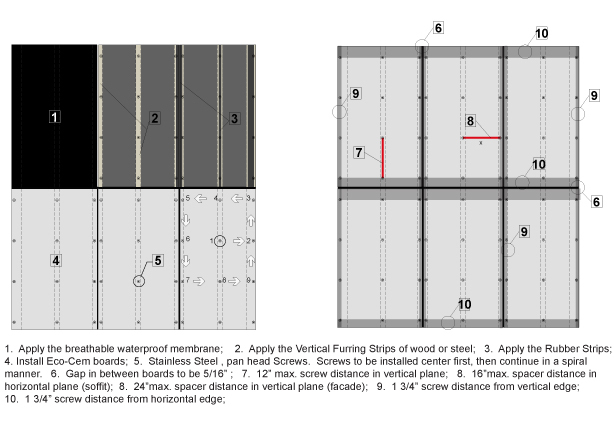 Eco-Cem can easily be screwed to steel or wood framing. We recommend pre-drilling the boards first. This not only helps prevent the board from cracking, but will also help to pinpoint the proper locations of the screws. 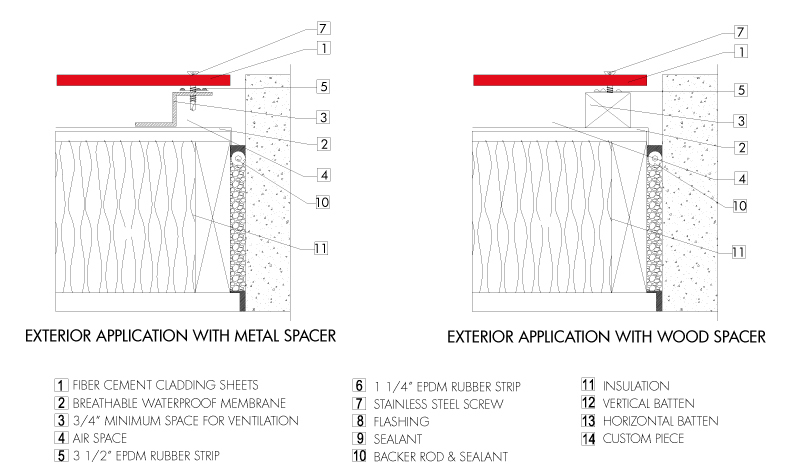 Please see our detailed drawings on how to properly install Eco-Cem boards onto vertical surfaces.